Sanday, one of Britain's northernmost islands, inaccessible when the wind prevents the ferry from the mainland crossing, or fog grounds the tiny island hopping plane. When human remains are discovered to the rear of an old primary school, forensic expert Dr Rhona MacLeod and her assistant arrive to excavate the grave. Approaching mid-winter, they find daylight in short supply, the weather inhospitable, and some of the island's inhabitants less than cooperative. When the suspicious death of an old man in Glasgow appears to have links with the island, DS Michael McNab is dispatched to investigate. Desperately uncomfortable in such surroundings, he finds that none of the tools of detective work are there. As the weather closes in, the team, which includes criminal profiler and Orcadian Professor Magnus Pirie, are presented with a series of unexplained incidents, apparently linked to the discovery of 13 magic flowers representing the souls of dead children who had attended the island school where the body was discovered. This is an atmospheric and very enjoyable mystery set on the remote island of Sanday in the outer Orkney Islands off the northern coast of Scotland. 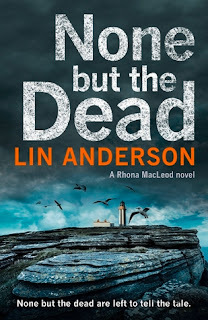 The eleventh in Anderson's series starring Rhona MacLeod, None But the Dead flows really well, and ticks plenty of boxes for crime-loving readers as it takes us on a fascinating, twisting journey alongside the Glaswegian forensic examiner. The story kickstarts with two bodies: one in Glasgow and one in Sanday. In the city, an elderly man is found dead in his flat in suspicious circumstances. A few hundred miles to the north, a skeleton is uncovered when a new arrival in the Orkney Islands is converting an historic school into a house. Sanday is an island steeped in history, but this skeleton is neither recent nor ancient, instead it's from a time decades ago but within living memory for some residents. And what does the grisly find have to do with the thirteen dust-covered flowers discovered in the old school's attic? Flowers that the new owner was warned to leave alone or risk disturbing the souls of long-dead children. Dr Rhona MacLeod is sent to the Orkneys to deal with and find answers about the skeletal remains. When DS Michael McNab stumbles over a link to Sanday with the Glasgow body, he heads out to the islands to investigate as well. There's an interesting tension between MacLeod and McNab. 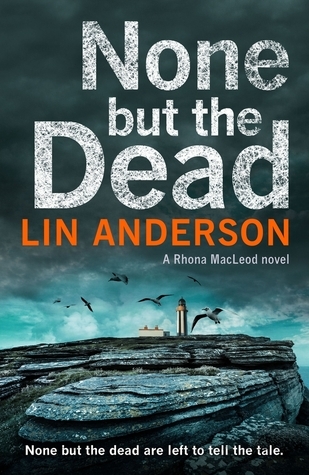 In None But the Dead, Anderson does a terrific job creating a vivid sense of Orkney atmosphere; its challenging weather, unusual geography, and rich history. The wildness of the place seeps from the pages, as the winds howl and rains lash the island. MacLeod and McNab are tested on several fronts as they try to extricate the truth behind two deaths. The islanders are an unusual community with plenty of secrets, and are none to keen to share them with officials from across the sea. The uncovered skull vanishes, McNab is attacked, and a young islander goes missing. The bones that brought Dr MacLeod to Sanday may be decades old, but there is plenty of danger in the present too. And as a storm closes in, MacLeod and McNab are marooned on Sanday, cut off from outside help. None But the Dead is a cracking page-turner that's likely to have new readers immediately adding Anderson's backlist to their TBR piles. Authentic, atmospheric, and a bloody good read.